Stroll down the New Iberia historic district to look for the beautiful trilingual historic bronze plaques that tell the story of New Iberia with its Spanish and French heritage. Click on website for exact locations. 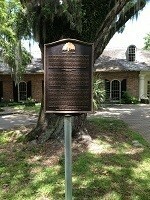 Click here to download Trilingual Marker Tour.